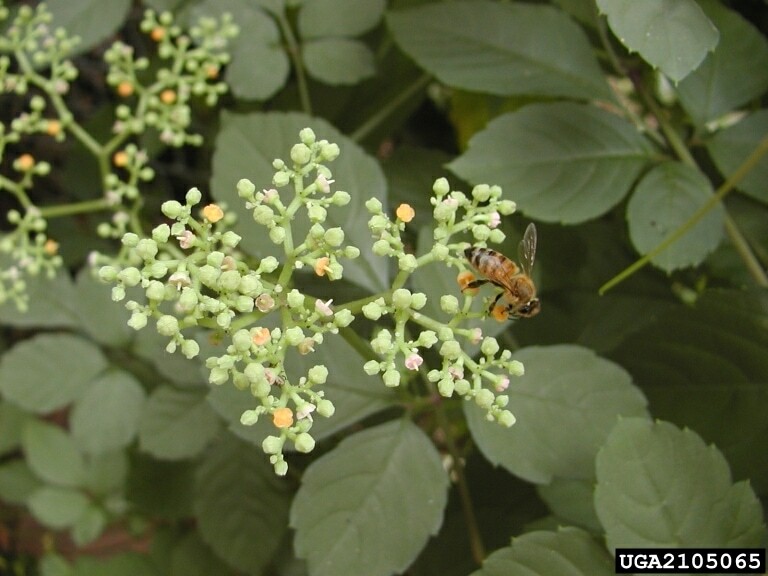 ANNAPOLIS, MD (September 9, 2014) – A new invasive vine related to grapes has appeared in Maryland. Like its cousin porcelainberry, bushkiller (Cayratia japonica) is a perennial vine with tendrils that allow it to climb up and over other vegetation. Bushkiller earns its murderous name by its ability to suppress other vegetation by blocking light and by weighing it down with biomass. Native to south Asia and Australia, bushkiller displays a tolerance for a wide variety of climatic conditions, demonstrating the adaptability shown by so many invasive plants. In the late summer and early fall, bushkiller is still producing multi-colored blooms, which is why MISC has chosen this plant as the September Invader of the Month. Bushkiller herbaceous vines are elongated, mature quickly and branch frequently. New stems are fuzzy with a purplish tint. The plant’s roots are creeping, and develop long rhizomes that produce new branches. As is the case with kudzu and mile-a-minute, two other unrelated invasive vine species, it is hard to tell where one bushkiller plant stops and another begins. The leaves may be the best identifying character of this vine, for they are pedate-quinquefoliate – they have five oval coarsely toothed or dentate leaflets, the two lateral pairs of which share a leaf stem. The terminal leaflet is conspicuously larger than the laterals, and has its own leaf stem. Overall leaf size is smaller – 2.5” by 4” – than the native vine Virginia creeper, which also has five leaflets. 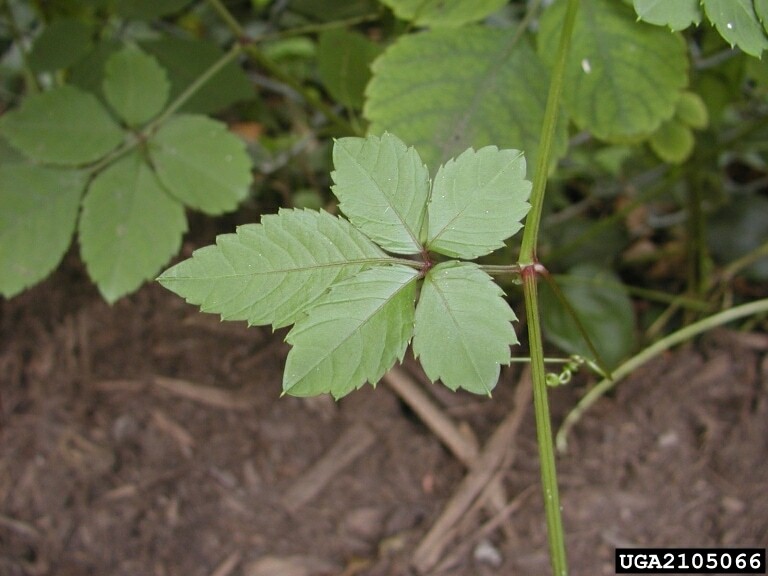 Bushkiller could be confused with Virginia creeper, but each Virginia creeper leaflet has its own stem (they are palmately divided) and they are toothed only above the widest part of the leaflet. Bushkiller has bifurcated tendrils opposite leaves at the nodes, but not on every node. Every third node will be missing a tendril. Unlike Virginia creeper, bushkiller does not have adhesive disks at the ends of its tendrils – another way to tell them apart. Inflorescences also occur opposite tendrils, and are corymbose–flat-topped clustered flowers with different length flower stems. Individual flowers are about ¼” wide with four green reflexed petals and a central disk that may be red, salmon-colored, yellow or white depending on the flower’s maturity. Flowers can be present for five months in the species’ home territory; in the southern US, observers have seen flowers from June to October. The fruit is a small deep purple or black berry containing two to four seeds. Native to southeast Asia, from India all the way across Japan to Malaysia and into northeastern Australia, bushkiller was first documented in North America in Louisiana in 1964. It was also found in the 1960s in Texas, and is now present in Alabama, Mississippi, North Carolina, Virginia and Maryland. It was most likely introduced as a horticultural ornamental. Bushkiller climbs up and over other vegetation, spreads by rhizomes and forms blankets over shrubs and trees. Its native habitat is tropical and semi-tropical, yet it persists in Maryland, though apparently spreads only vegetatively; it does not produce viable seed here. This means that in Maryland, it is not spread by birds. Control is reportedly quite difficult, in part because the vine covers plants that land managers want to keep. One study showed that the regeneration of root fragments is extremely high, so pieces left in the soil after cutting or pulling have the capability to regrow. A fragment as small as 1 cm long produced shoots; root fragments planted more than one foot deep were still able to reproduce. This means that the plant could survive mowing, cultivating, grazing and could likely be moved to new infestation sites when transported with soil or mulch. An extensive herbicide trial in North Carolina indicated that relatively few materials had much impact on bushkiller, but several mixes including triclopyr were effective after multiple applications. For more information about Invasive Species of Concern in Maryland, visit the Maryland Invasive Species Council.